Nalae clutched her cloak, staring up in fear at the two vagabonds that now prepared to rob her. Since when did princesses get approached by such people? In a flash of memory, Princess Nalae remembered exactly how she got herself into this situation. It was only yesterday evening that she was with her father, King Toramun, at the balcony of the palatial palace complex that served as both a court to the king and a home to the royal family. Both the young Cybunny and the regal Krawk were watching the sun set on the horizon of Sakhmet City, painting the sky a brilliant red, purple, pink and gold. “Papa, I was to go out and see the people.” Nalae tugged at the hem of her father’s cloak. It was a social, unspoken rule that Princesses didn’t go out to meet the people as the class of royalty and the other classes were too different and the city was too dangerous for someone like Nalae. However, her curiosity was honed to the keenest edge and the princess was eager to satisfy it by seeing the outside world. “You know that you are too young.” The yellow Krawk chuckled. “But I want to see the city!” Nalae gave her father a petulant frown. The green Cybunny shifted a stubborn lock of hair and snorted with disappointment. After a few giggles, Toramun finally managed to eke out a promise from his daughter that she would make it a priority to attend the banquet, no matter how much they both disliked it. When the sun had fully set and she returned to her quarters to sleep, the young princess grabbed her cloak, a backpack with a snack so she wouldn’t get hungry, and a thick rope. It wasn’t the first time she wanted to see the city, and in fact she spent a week planning on how to make her nightly romp a success. Since her father banned her from seeing the city until she was older, Nalae decided to see it of her own accord without his permission, that very night. Nalae gave the rope a tug and then opened her window, but not without putting a dummy under the covers of her bed in case anyone came in to check on her that night. The rope dangled precariously off the side off the Palace’s right wing wall, and once it stilled and touched level ground Nalae tied it to her bedpost, hiding it strategically with clothes and other things. In moments she was breathing the crisp air of the night, her heart pounding with excitement at her escapade. After a few terrifying moments, the princess that hardly ever got to do such things set her feet upon the ground. A moment of relief was all that she allowed herself: she needed to get away from the palace grounds as quickly as possible. On her way down, she closed the window as best she could and then hid the rope among the tangled vines that crept up the limestone walls of the building. Upon finishing she covered her soft white fur in the ruddy cloak at ran off into the night, brimming with joy. It was not long before the princess bounded into the city. It was so huge! The bunched mud-brick buildings with dark alleyways separating them seemed foreboding but almost exotic to the Cybunny who never even saw them before. Torches were lit outside, providing some light with which to maneuver in the absence of moonlight. Compared to the vastness of the palace and the marketplace which stood right outside, the districts were absolutely claustrophobic. Nalae realized that she was walking in one of the poorer districts closer to the edges of Sakhmet, and the simple thought made her shudder with a hint of fear and pull her cloak tighter around her form. She never realized how scary the place looked at night. In day time the city seemed to glow! And that was how she found herself confronted by the thieves. After some aimless walking, she bumped into two Techos with yellow eyes that were dressed in dark cloaks. It was too late that she realized that she still had her intricate earrings on, as they noticed it and proceeded to try and take the golden jewelry from her. “I’ll tell my father!” Her voice was but a squeak. Princess Nalae felt the wall form behind her and a sudden paralysis of fear fill her paws. What was she to do? As the wicked hands reached for her earrings, there was a sudden yelp and the two would-be-robbers whirled around, staring at another cloaked being pointing at some light from behind a building. In the blink of an eye the Techos were running down the road until they melted with the night. Suddenly, a strong arm wrapped around Nalae’s and the Cybunny stiffened once more. Was she finally caught? A wave of relief at the guards’ presence melted into a wave of dread. What if her father found out about her outing? Somehow she followed the command and began to run with the strong figure beside her. As she ran, her hood flew back a bit and she noticed the light behind the house was that of torch-light. “Why are we running? There are no guards!” Nalae protested breathlessly. “Because those boys will probably realize the trick soon and will come back. By then, we will be long gone,” the female voice responded. Deciding not to argue with that logic, Nalae put her trust in this stranger who saved her from the thieves and followed the dark, cloaked form around three more houses and finally one big warehouse before turning a corner and plunging into absolute darkness. Nalae squealed with shock as the warm night disappeared and became a cool dark chamber. Suddenly frightened, wondering if this fellow was not in fact a savior but more danger, the Cybunny began to feel around for the exit but stopped when a light emerged nearby. A fire was set up in the center of the empty warehouse room, and by the looks of it the fireplace was used frequently. As it rose in intensity, the fire gave off light and Nalae finally got a good look at her surroundings. By the multitude of boxes, she realized that this was indeed a warehouse, but probably an abandoned one. Seasoned wood and bags filled with something were scattered everywhere, and some were placed in patterns. After a moment of thought, the princess realized that many of these were actually beds. A table was made out of box-wood, and seats as well. Lovely textiles and carpets decorated the walls of the room, and she realized that although the place was odd and dirty, covered in dust and cobwebs, it was incredibly well furnished. At least, as best it could be. In addition to the room, Nalae also saw her savior. A lean pink Xweetok with powerful arms finished managing the fire and looked up at the Cybunny. “Y... you seem very proficient in the works of thieves,” Nalae started awkwardly – she never spoke to those of lower class before. “Good, we are running out of bandages. 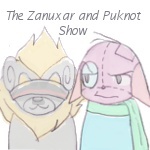 Falc managed to break an arm when running away from the Trumpets, and he forced us to use up so many rolls of bandages that we only have half a roll left.” The Xweetok piled some wood upon the fire. The Princess stared dumbly at the odd language of this commoner. Trumpets? Who were they? Why couldn’t she simply buy the bandages she needed? Nalae watched as the Xweetok, who she realized was clad in clothes that had quite a bit of wear and tear on them, moved to the back and after a minute or so returned with an old cup, holding it with such reverence that Nalae hesitated to touch it. To her, golden juppie juice was a drink for the poor and was something she could get in moments. For a moment or so she was about to ask for blue cocofizz, which was her favorite beverage and strangely enough one of the more expensive drinks on the market, but she managed to keep her tongue still. “So what is your name?” the Xweetok asked, settling upon a box while Nalae sat upon a comfy bag. After a pause, Nalae decided not to reveal her name. “Kasha,” she stated flatly. An odd silence followed as the two neopets became immersed in their thoughts. But then the fire flickered more brightly and Nalae spotted something tattooed on Hawke’s shoulder that made her blood drain. “You’re one of the Desert Scarabs!” Nalae tried to instinctively move away but her feet were like lead. The Desert Scarabs were a notorious group that was famous for their ingenious and often successful plots to steal. Often the missing objects were food, drink and clothing, but sometimes rarer objects could disappear as well. In addition, they had the uncanny ability to elude guards, no matter how skilled they were. The royal household often tried to put an end to the Desert Scarabs, but they eluded every effort to find them. Now, the young Princess of Sakhmet was drinking golden juppie juice in one of their strongholds. The Cybunny nodded sheepishly in response. “You know, we are just trying to survive. I mean, come on, life is hard. Every day is a struggle. Food isn’t easy to find, and the money to get it doesn’t come into our paws easily either. Those Trumpets – guards – are making life even more difficult for us. It’s not like we are trying to do something so terrible as steal from the royal treasury, even tough Marc tried once and failed miserably,” Hawke giggled and looked distant as if experiencing a good memory. Nalae decided to forget that she heard that statement. The fire crackled softly as the two contemplated all that was said. Nalae realized that everything she heard about the Desert Scarabs was quite the opposite. She learned that they were dark-hearted, evil and cunning thieves that stole frequently from the Royal Treasury. They were a menace to society that vandalized public buildings and could easily hurt the innocent, and therefore had to be stopped immediately. But after listening to Hawke and seeing first-hand their conditions and whatnot, Nalae realized that it was the words that she grew up hearing were false. Suddenly, there was a creak of an opening door and both neopets turned to behold a rather scraggly Lupe with a bandaged arm that entered the room with three others, all of them grinning broadly and bearing burlap bags that seemed to be quite full. “Hawke, look what we got, haha!” The Lupe overturned his bag, and Nalae spotted something round roll out. The others did likewise, and she realized that the bags were in fact chock full of food! Breads, somewhat stale but edible came out first, followed by the orb like tchea fruits, ummagines, and even something that looked like a haunch of meat. By the look on Hawke’s face, Nalae realized that this was a miracle. “Falc, how did you get all of this?” The Xweetok was stunned. “Coming. I saw them near the market.” A deep voice came up from a Desert Scarab hidden in the shadows. “And who is this lovely lady? A new recruit?” Falc leaned over and eyed Nalae with amusement, much to her chagrin. Falc nodded and lazed back on his throne, watching the others much like a king watches his subjects. The princess pursed her lips, feeling the urge to ask if they wanted her help but at the same time being unwilling to interfere. She watched with fascination as two more came in, one of them a Lupe who looked so similar to Falc that she decided they were brothers. It was not long before they were laughing, singing and eating by the light of the golden fire. A Blumaroo with a medium build and worn sandals began to pass around the bread, cut with a sharp knife. While the others ate with pleasure, Nalae sat and wondered how to make the bread palatable without offending her hosts. Suddenly it came to her and she flipped open the bag that she brought along with her, revealing all sorts of goodies. Suddenly feeling shameful, Nalae turned to the Desert Scarabs and began to offer them her snacks. It was almost like she had become part of the gang in an instant. Delicious pastries were passed around, as well as some sweets and a stick of butter to spread on the bread. By the time the fire had burnt down to bare embers, the food she brought was eaten and the rest put aside for storage, while the happy clan settled back with contentment. “Thank you for the meal, it was amazing. I haven’t had such good food in ages,” the Lupe by the name of Marc – who was indeed Falc’s twin brother – said to Nalae, who smiled in a bitter mixture of happiness and guilt. Happiness at the fact that she had made others so happy, and guilt because they didn’t know who she really was. Nalae paused for a moment in thought, realizing that she was too tired to make the trip back to her real home and that it was perhaps for the best that the others didn’t know who she was just yet. With a long, tired yawn, the green Cybunny rubbed down her fluffed mane and then rubbed her eyes. “If you don’t mind, is it okay if I sleep here for tonight? “Of course we don’t mind,” Falc said, preparing his bed near the back. “Won’t your parents be worried?” Hawke asked. “Not a problem, let me make you a bed.” Hawke turned and began to put boxes together, covering them with two soft blankets to act as a mattress and then making two others into a pillow and a covering. The Cybunny princess realized that although this bed was not as soft as her own back in her quarters, the bed that was made from fine Gnorbu wool and stuffed with the finest weewoo feathers, it was comfortable and warm. When it was close to dawn, Nalae shifted and felt someone prod her back. Grumbling and about to snap at the servant for waking her so rudely, she quickly remembered where she was and bolted upright, biting her lips to stop the words from coming out. Hawke grinned impishly at her. Nalae looked around and realized that the Desert Scarabs had in their possession a working gallion clock that hung on the wall of the room, though how they had it was beyond her. The pink Xweetok nodded and then went around the beds of the sleeping Scarabs to get Nalae’s cloak and now empty sack. The sun hadn’t risen yet, but Nalae managed to see well enough to maneuver her way around the districts until she returned back to the palace grounds. Breathing a sigh of relief at not being caught by either guards or thieves on her way here, she quickly found her rope still secure and clambered up the wall just as the golden sun peeked over the edges of the dunes of the Lost Desert. The following night, she left to see the Desert Scarabs once more, laden with good foods, a stick for protection and all her jewelry save for the golden ring that had the royal insignia on it taken off for the journey. After getting lost a couple of times, she finally managed to get to the hideout and was welcomed warmly by the Desert Scarabs, who accepted the food she brought with smiles and heart-felt thanks. The night wore on, and she learned about their pasts. Falc and Marc were blue Lupes that were originally sons of a wealthy merchant who disappeared in a harsh storm one night and left them with nothing, so they turned into thieves and eventually joined the group. Hawke was a thief all her life, but when she joined the Scarabs she took on a motherly role for the younger recruits and took care of the hide-out in their absence. Nalae decided that she liked Hawke quite a bit. As they talked and ate the pasties that Nalae brought with her from the palace kitchens, Marc and a younger recruit ran in, breathless and frightened. “What’s wrong?” Hawke’s hackles rose. “What? Why?” Falc stood up from his mock throne. Nalae felt her blood freeze, melt and drain from her face. The Banquet! How could she have forgotten? Before they could even run, the door to the warehouse room was torn off its hinges and flung aside, revealing huge, muscular Elephante guards bristling with weapons. In an instant, chaos descended upon the unfortunate group as the guards thundered through the threshold and captured the Scarabs – they stood no chance against the tide. Nalae was grabbed harshly by a well-armored guard that she recognized as Captain Shon, one of the palace guardians that made daily rounds upon the walls of the complex. That moment that the two locked eyes, the Elephante’s widened and he trumpeted a call to the others. As the group was rounded up, Nalae looked at Hawke with tearful eyes. The Xweetok returned the gaze with a look of astonishment and disappointment, especially when her golden ring became visible. And then the princess began to cry. The Sakhmetian dungeons were cold, dank, and dark. As the iron doors parted before the Cybunny, she managed to catch sight of the figures that huddled behind the bars. After walking by a few quarters, she finally spotted a Xweetok and bid the prison warden, a stout purple Shoyru, to open the door and let her in. After a few whispers, he left the door open and stood aside. Tears stung Nalae’s eyes, but they didn’t overflow. Hawke turned around and eyed the princess warily, and Nalae couldn’t blame her. “There is a catch, isn’t there...” the Xweetok murmured. There was a silence, and the Hawke’s face softened. “I promise on behalf of the Desert Scarabs,” she whispered solemnly. A smile broke through Nalae’s tears and she gave Hawke a hug.